RPC-212 and its related instances of RPC-212-1 through RPC-212-3, are to be contained within a 30 x 30 x 204 300 x 300 x 200 meter Tobruk-class containment chamber in Containment Sector B of Site-074. No fewer than 20 Authority Security personnel and 10 remote-controlled sentry turrets are to guard the entrance to the chamber at all times. Following Incident 212-CON/1, object class has been updated to Beta-Orange and the object itself has since been guarded by numerous instances of RPC-212-1, RPC-212-2, and RPC-212-3. Instances will become hostile during an RPC-212-CON event or when RPC-212 is threatened. Should another RPC-212-CON event occur, testing is to be postponed and the containment chamber should be locked down. MST Tango-10 "T-Poser" is to be deployed to reinforce Containment Security Force. Description: RPC-212 is a throne, covered with motifs that resemble multiple kind of insects with no particular pattern. Its materials consist of wood, quartz, and chitin. Discovery: RPC-212, along with an instance of RPC-212-3 was found in a nuclear bunker in the outskirts of Zürich, Switzerland. RPC-212 was found after several reported sightings of a "scorpion monster" roaming the area. Object was then almost immediately retrieved by MST Tango-10. Stage 1: Five seconds after sitting on RPC-212, subject will have difficulty removing themselves from RPC-212, this is caused by the tranquilizing pheromones emitted by RPC-212. The subject may fall asleep during this time period. During this time, the subject's skin will begin to turn any variety of colors, the possible variances are as follows: red, black, yellow, green, navy blue, or gold. Stage 2: Subject's Brain rapidly degrades6 until it is comparable to that of a human teenager, retaining most of their knowledge prior transition. Subject will experience a severe headache that lasts for the duration of this stage. During this stage, RPC-212 will install a "hive mindset"7 into the transformed subject. This stage can be bypassed if subject has administered RPC-925 prior stage 2. Stage 3: the subject's body will develops into RPC-212-1, RPC-212-2, or RPC-212-3. Where and how the insect features grow on the subject varies. Subject will be experiencing mild, sharp pain all over their body during this stage. Subject's general body size will be the same prior transformation. Stage 3 lasts for 25 minutes. After 25 minutes, RPC-212 will stop emitting tranquilizing pheromones and the subject is now able remove themselves from RPC-212. Description: RPC-212-1 resembles a Formicidae8, they are commonly red in color, although black colors variants exist as well. RPC-212-1 features an insect abdomen that sprouts from the tail bone. RPC-212-1 activity includes, but not limited to: gathering food, defending the nest, build fortification, ect; Hence it is considered to be the multi-purpose worker class of the hive. Description: RPC-212-2 resembles a Vespa orientalis9, they are commonly colored yellow with black stripes, thought a green and red with black stripes variant exist. The Hornet features an insect abdomen which seems to sprout from the tail bone, equipped with a 35 to 65 Centimeters long stinger. RPC-212-2 features a pair of wing with a size of 50 to 110 centimeters long, which can be used to fly at 110km/h at 6000ft. Description: RPC-212-3 resembles a Pandinus imperator11, they are commonly navy blue in color, with a gold and black color variant existing. RPC-212-3 features a pair of pincers for either just hands or entire arms, a powerful 40 to 220 centimetres long scorpion stinger which sprouts from the tail bone and contains paralyzing and/or poisonous scorpion venom, and considered to be the solely-fighter/brawler of the hive. Description: RPC-212-CON refers to an annual event that happens during Late-November to Early-January. During this event, RPC-212-1, RPC-212-2, and RPC-212-3 will actively "hunt" human beings in the vicinity for new members of the hive. RPC-212 is able to transform multiple humans at once simply by the victims being in contact with it. To minimize the chance of an outbreak and a possible containment breach, at least one CSD personnel should be "sacrificed" to the hive. Procedure: Subjects have been instructed to build any kind of fortification. Building materials such as bricks and cement was provided. Results: 4 out of 5 RPC-212-1 instances has succesfully build a light pillbox. One of the instances was sleeping through the whole procedure. Procedure: CSD-3327 was instructed to sit on RPC-212 after they were administered RPC-925. Results: CSD-3327 transformed into an instance of RPC-212-2. Subject appears to retain cognitive function prior to being transformed. Subject is then put into a temporary containment cell. 20 minutes later, the subject breached containment and immediately killed 5 Authority Security Personnel as well as 2 Scientists. Subject was terminated via gunshot wounds to the chest, inflicted by MST Tango-10 and surviving Security Personnel. Subject's body is incinerated afterwards. Procedure: CSD-4337 was instructed to pierce the following items with his stinger: wooden board, stone brick, 20mm of steel plating, and 75mm of steel plating. Results: CSD-4337 was able to pierce the first three items without difficulty, and it took the subject 4 attempts to completely pierce the 75mm steel plating. Multiple Beta and Gamma level of containment breaches, starting with RPC-212, RPC-497, and RPC-███ occurred on November 30th, 200█. Documents related to Incident 212-CON/1 and RPC-212 have been compiled in this section. Foreword: The interview takes place inside RPC-212's containment chamber. Agent Guderian was escorted by two Authority Security Personnel. Agent Guderian: How are you today? Agent Guderian: Great! We're gonna do an interview tonight, you think you can do it? Agent Guderian: Was that sarcasm? Agent Guderian: I'm going to ask a few question, try to be cooperative. Agent Guderian: Let's see…Do you remember anything prior transformation into what you are now? CSD-8903: Ja…sad memory…[CSD-8903 starts expressing sorrow, but regained his composure a few seconds later] but it's okay, the hive gives me purpose and I'm satisfied with that. Agent Guderian: Are you really satisfied? Or is it just the Cognitohazardous effect of RPC-212? Closing Statement: During Incident 212-CON/1, An abnormal instance of RPC-212-3 was found roaming the containment sector's armory. After containment, it is revealed that subject happens to be Agent Guderian, who had utilized RPC-925 to bypass Stage 2 of the transformation. Agent Guderian was then put in a temporary containment and soon after put back into service and transferred into Authority Security Force 16th Battalion. The doors to RPC-212's containment chamber malfunctioned and caused a containment breach. MST Tango-10 has been dispatched to resolve the incident. Following the incident, site-074 was critically damaged, and approximately ███ personnel have been counted as either killed, missing, or transformed. Approximately ███ of the RPC-212 instances were terminated, with the remaining numbers recontained. All deceased personnel are to be replaced immediately, and MST Tango-10 are to be stationed at Site-074 in case of similar incident in the future. Agent Guderian was transformed into an abnormal instance of RPC-212-3 during Incident 212-CON/1. Agent Guderian retained his normal skin color, and only lost a few strands of hair. He had only obtained a scorpion stinger. No other additional traits found. Stinger removal will be available after testing with an RPC-212-3 instance. Foreword: Agent Guderian was interrogated in a makeshift interrogation room by a specialist to confirm his mental stability, as most of the Site psychiatrists were either killed in Incident 212-CON/1 or had evacuated the site. Sergeant Günter: How does your stinger feels? Sergeant Günter: I'm sure you will. Now, onto the matter at hand, are you really the same Guderian that I know? Sergeant Günter: You could already be transformed before you get your hands on an RPC-925, you could be tricking us right now! Admit it! Agent Guderian: I knew you'd ask this question, so I brought the security tape that recorded my transformation, give me a moment…[he shuffles through his pocket, eventually pulling out a tape]…here it is, take it. Closing Statement: Agent Guderian has been confirmed to be free from RPC-212's Ideological Hazard. 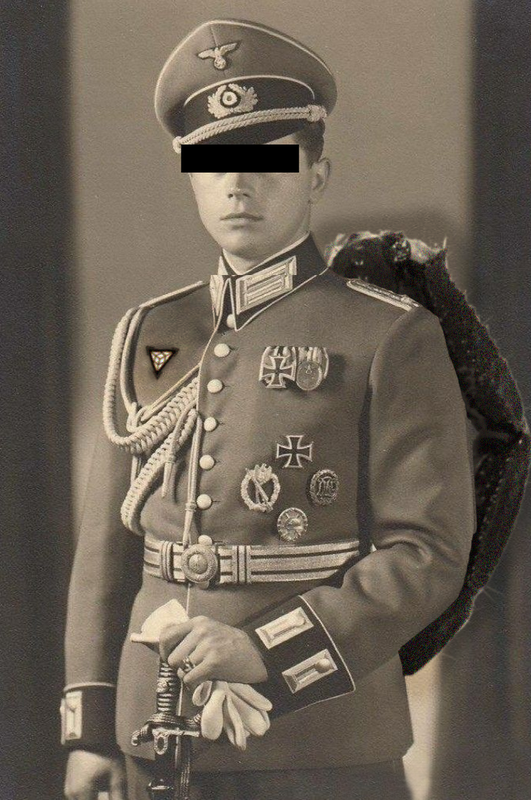 Major H███████ Guderian, post-Incident 212-CON/1. Addendum 2: Following Incident 212-CON/1, RPC-212 along with its instances are to be moved to a new containment chamber. Addendum 3: RPC-212, along its instance are to be moved into a larger containment chamber since the previous containment chamber has gotten overcrowded. Addendum 4: MST Tango-10 "T-Poser" is now officially garrisoned in Site-074 and has been additionally trained to handle grouped anomalous creatures. 5. While it is difficult, it is possible to remove oneself from/get someone to help subject get off RPC-212 at any stage, with the risk of retaining features from respective stage in which subject escapes from. 6. Neurodegeneration; degeneration of the nervous system, especially of neurons in the brain. 10. Other instance of RPC-212 may be able to use firearms as well, but they requires basic firearms training and/or experience.